If you’re looking for a USB-C battery with no compromises and with all the extras, consider the Anker PowerCore+ 26800 PD ($119.99 MSRP; $110 on Amazon). Using Power Delivery 2.0 (PD 2.0), the Anker battery can charge a MacBook, MacBook Pro, or other USB-C devices at up to 30 watts, allowing use of most laptops while you’re recharging. 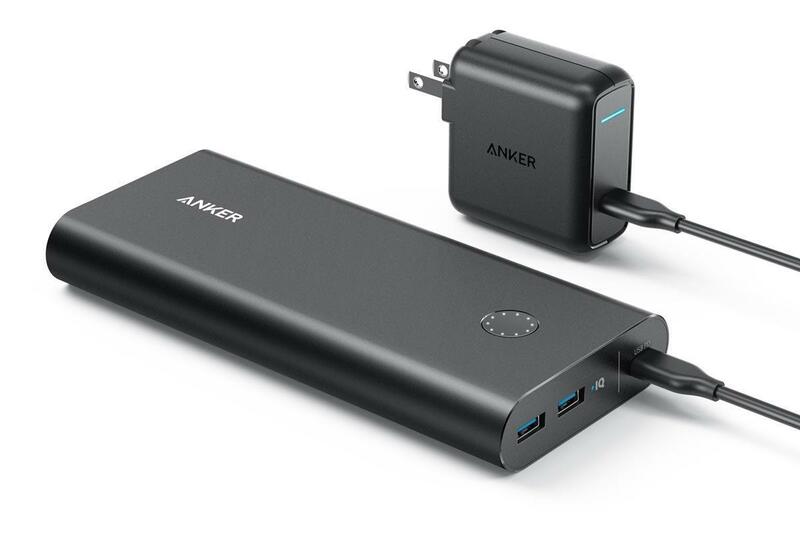 Anker has paired its 30W output charge for devices with a 27W recharging capability and includes a small AC adapter capable of that feat. The PowerCore+ 26800 has internal cells that add up to 26,800 millampere-hours (mAh) or 96 watt-hours (Wh). It took about two hours to fully recharge a 2015 12-inch MacBook with a new Apple battery from empty, and about five hours to recharge the PowerCore+ 26800. That’s substantially faster than any other USB-C battery without PD 2.0 on the market. With a little math, we can figure that the PowerCore+ 20100 consumed 65Wh for a full MacBook charge, while the PowerCore+ 26800 used an efficient 45Wh, including powering the laptop while recharging it—about 30 percent less energy required. The 2016 and 2017 MacBook Pro models have batteries that range from slightly more to about twice the capacity of the MacBook, so you’ll be able to charge smaller models twice or nearly so and larger models fully at least once. In addition to the USB-C port, the pack also has two USB Type-A jacks that can each output a maximum of 15W (5V at 3A) at the same time, useful for both iPads and other mobile devices, which typically max out at 2.4A over Type-A, but also to charge other USB-C devices capable of handling 15W with a Type-A to USB-C cable. The PowerCore+ 26800 not only comes with a USB-C adapter, but a USB-C to USB-C power cable that worked fine with the MacBook as well as the adapter. Anker also includes a Type-A to Micro-USB cable, and a mesh carrying case. At 1.3 pounds, it’s not light, but it’s worth its weight. At 7 by 3 by 1 inches, it’s fairly compact, too. The company offers an 18-month warranty. There's a lot to like about the Anker PowerCore+ 26800: the large power capacity, the fast charging of Mac laptops, and USB ports for charging iOS devices. It's hard to go wrong with this battery pack.